While it was a great opportunity for the town, I can't admit to being particularly inspired by the efforts of the 'Apprentices' in re-branding Margate, shown on the BBC programme last night. Whether it be attracting family tourism or the 'pink pound' the contestants seemed to be short of good ideas and their efforts revealed the real challenges the town faces in regenerating itself and attracting tourism to sustain its seasonal economy. Ironically, while Margate was suggested as potential destination for gay tourism, Canterbury is in the papers today, accused of not being gay-enough. A complaint has been lodged with the Local Government Ombudsman by the Pride in Canterbury pressure group which also complained about the "stereotypical" depiction of a homosexual character in a play staged at the city's Marlowe theatre. What 'The Apprentice' illustrated well last night, were Margate's fabulous seafront view and its beach but the programme revealed some of the many legacy problems that have to be solved if the town is to fulfill its potential. In the present harsh economic climate real progress is bound to be slower than people would wish. Surprisingly, the contestants entirely missed the creative arts debate, the building of the Turner Contemporary and the re-development of its Old Town as potential opportunities in attracting new visitors, pink or otherwise. A great many people are working together from many different organisations as part of a broad and energetic effort to resurrect Margate's fortunes as a premier seaside destination. I think I may have written in an earlier entry, that if the town were to attract the genorosity of a passing Arab Sheikh, like the ruler of Dubai, then change would be rapid. 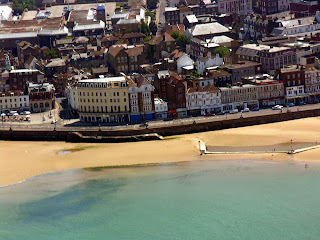 However, given the absence of any oil wells Margate can only work within the resources it has available, as one among several historically popular seaside resorts in Thanet. While 'The Apprentice' may have failed to impress in its own particular branding exercise, given time and investment, I believe that with the current strategy, Margate can recover much of its former glory but a great deal of behind-the-scenes work needs to be completed before it can. Surely the council would be well advised to steer well clear of passing Sheikhs, given the famously embarrassing 'fake sheikh' scandal of the past. Perhaps the apprentices 'missed' the Turner Contemporary because, like most people round here, they thought it was a pointless white elephant which has no relevance to the regeneration/rebranding of Margate, or to marketing the place as a tourist/seaside destination. Discuss. It seems to me that the first thing that needs to be done is tackling the deplorable state of most of the seafront buildings. The first impression visitors get is something akin to an abandoned ghost town that has absolutely no appeal to outsiders and it is only the 'sentimental' visitor harking back to happy summer holidays that comes here. After dark it is a totally different place, a no-go area to those who have stepped over vomit covered, scantily clad women and passed urinating drunks as I have. There is no answer to the problem until the locals are so sick of it that they demand change. I am disappointed that the Apprentice didn't help to boost the area, it seemed half-hearted to me and even the group of locals gathered to vote on their efforts seemed disinterested, Brian Sullivan himself appearing soporiphic ! We have some great buildings here, as was pointed out, yet they are decaying and unkempt. Landlords have to show more pride in their town and make an effort. We could start with bringing back the hanging baskets, plant more flower beds and stop this damaging zero tolerance for petty 'crimes' such as dropping a cigarette end. What message are we sending out when you read that the Magistrates court have fined several people this week and made £500 ! I do not want litter everywhere but it seems a bit pedantic when you consider the basic view of Margate is one of decay and delapidation. The picture you show is very well taken, unfortunately it does highlight a few run down features that can be easily rectified. Firstly, the boating pool is completely silted up. Many years ago this shallow pool was a safe childrens play area catching crabs and doing all sorts of things ,there used to be little rowing boats in the shallow pool, . Then there is the Kings steps on the left, years ago pleasure boats and other boats could use it. Now because the sand has silted up the facilty has been become unusable. I think I said enough the picture tells it all. What strategy would that be Simon, apart from being at the beck and call of any old spiv developer, it would be remarkable if you or any of your tory cohorts were to stumble across some hitherto unnoticed master plan. Thanet tories seem to stumble from one crisis to the next. And just think had it not been for your equally competent Tory colleagues in Maidstone we would by now be wallowing in culture at the recently opened Turner. I reckon you should have stuck with more rational Liberal types. Tony, are you sugegsting that any other political group could do a better job? Developers aside, it's all about money or the lack of it. Councils exist to provide services and when a local economy is healthy, everyone benefits. Councils rely on the private sector, developers and businsses alike to provide the catalyst for that same healthy economy. As a result both are sensibly encouraged to invest as without them little real progress can be made. "Margate can recover much of its former glory but a great deal of behind-the-scenes work needs to be completed before it can".